The ‘Mary Poppins Returns’ actress holds her white purse to cover her stomach as she wears a loose dress for a romantic dinner with her husband in New York City. Emily Blunt and John Krasinski stepped out for a date night in New York City on Thursday, April 11. The pair were walking arm-in-arm as they headed to a restaurant for a romantic dinner for two in the Big Apple. The two’s outing together was enough to cause a chatter on the Internet, but it was the actress’ body language that perhaps intrigued one’s curiosity the most. The English-born beauty, who carried a white purse, suspiciously placed it strategically to cover her belly as if she’s trying to hide something. Could it be that she’s pregnant with baby No. 3? Emily and John dressed casually for the outing. The 36-year-old actress looked effortlessly chic in a khaki maxi dress topped with a deep blue coat. Her husband donned a violet shirt with a black jacket and pants. They both wore matching white sneakers. Emily and John, who have bought a condominium in Brooklyn Heights, are already parents to two daughters, 5-year-old Hazel and 2-year-old Violet. The pair, who were married in July 2010 after dating for less than two years, have been rumored planning to have a third kid and give their daughters a brother. 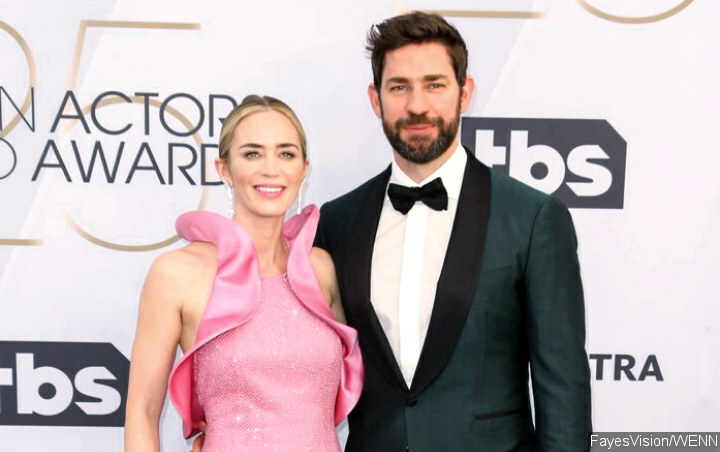 The possible third pregnancy aside, Emily and John will reunite in “A Quiet Place” sequel. John, who directed the first installment, is returning to pen the script and serve behind the lens. Emily will reprise her role as Evelyn Abbott, with Cillian Murphy recently being reported to join the cast. “A Quiet Place 2” is slated to arrive on May 15, 2020.